When Pew Research Center surveyed 14 advanced economies in the spring of 2016, one thing was clear: In each of the countries surveyed, nearly all people reported owning a mobile phone. But the shares who own a smartphone vary considerably. Rates of smartphone ownership were considerably lower in some of the other countries surveyed. About half in Poland (52%) owned a smartphone, though that figure is up significantly since the question was first asked in 2013, when only 21% reported owning a smartphone. And while pluralities in 13 of the 14 countries surveyed reported owning a smartphone, regular mobile devices are still fairly common in Greece (43%), Hungary (41%), and Poland and Japan (both 37%). There are sharp digital divides when it comes to reported smartphone ownership within the countries surveyed. In every single country, younger people, those with more education and those with an income above the country median are more likely to own a smartphone compared with older, less educated and poorer members of their societies. For example, 84% of Greeks ages 18 to 34 reported owning a smartphone. Among Greeks ages 50 and older, only 13% owned a smartphone. Among more educated Greeks (those with more than a secondary education), 79% owned a smartphone vs. only 35% of Greeks with a secondary education or less. In Italy, those with an income above the national median are 38 percentage points more likely to own a smartphone than those earning less than the median income. 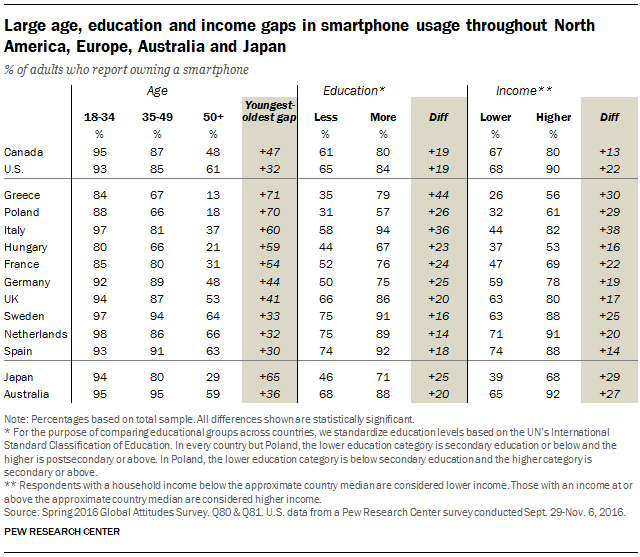 Such age, education and income-based digital divides are seen around the world, not just in richer countries. Among the countries surveyed, only in Japan were men more likely than women (62% vs. 49%) to own a smartphone. For more on how many adults in several advanced economies use social media, see here.